Inspired by the outrageous variety shows popularized throughout Asia, ISA! features 10 celebrity contestants playing hilarious games and squaring off in head-to-head challengs. Contestants include Ted Fu, Jen (FrmHeadToToe), David Choi, Clara C, Ally Maki, Freddie Wong, Brandon Laatsch, Wesley Chan, Mike Song, and Anthony Lee. 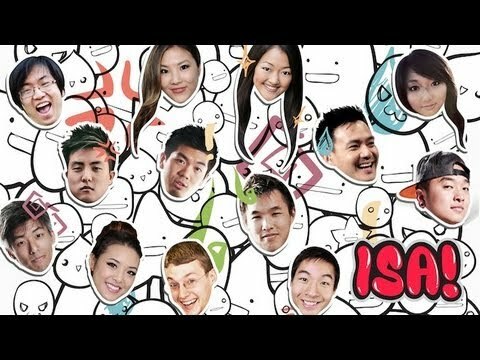 Hosted by Amy Okuda, Philip Wang, and gamemaster Yoshi (KevJumba), the first episode of ISA! begins by getting to know a little bit about each contestant in “Two Truths and a Lie.” After the intros, it’s off to the first game “Pass It On”. How will the phrases “Wizard of Oz” and “Harlem Shake” get transformed from one end of the line to the other end? Look for the pop up graphics just like on the Asian games shows to reveal what really goes through the mind of each contestant. Behind the scenes of ISA! This entry was posted in comedy, events, shorts on May 26, 2013 by Kevin Hsieh - channel APA.